The whole summer has been building up to this moment. It’s true that tomatoes, thanks to globalization and hothouse farming, are available year-round. But those tomatoes are wan in comparison to real, ripe field tomatoes. I’m talking about local tomatoes. Tomatoes that are juicy and complex, almost ambrosial. Not thin and mealy tomatoes. With tomatoes this good, only the simplest preparation will do them justice. Slice them into rounds. 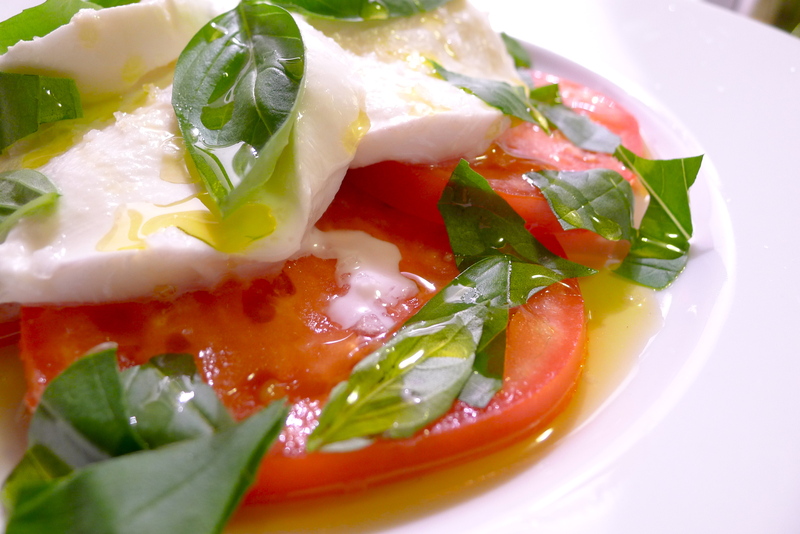 Top them with thick slices of mozzarella di bufala, if you can. Sprinkle them with flaky Maldon salt. Hand-tear heady leaves of basil, and scatter them over the top. Dribble the best extra-virgin olive oil that you have over everything. Have some good crusty bread ready to sop up the juices left on the plate in after the tomatoes are gone. A pleasant wake. Balsamic vinegar, though trendy, does not belong in insalata caprese; it’s strong flavor overwhelms the delicate acidity of good, late summer tomatoes.